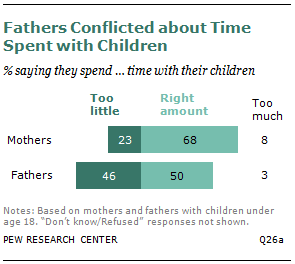 Fathers are much more likely than mothers to say they are not spending enough time with their children. Image from Pew Research Center Report. Fathers who are growing more committed to their families face ever-increasing demands in the workplace. 48% of working fathers have missed a significant event in their child’s life due to work at least once in the last year and nearly one in five (18%) have missed four or more. More than one in four (27%) working dads say they spend more than 50 hours a week on work and nearly one in 10 (8%) spend more than 60 hours. One in four (25%) working dads spend less than one hour with their kids each day. 42% spend less than 2 hours a day. 36% of working dads say their company does not offer flexible work arrangements such as flexible schedules, telecommuting, job sharing and more. 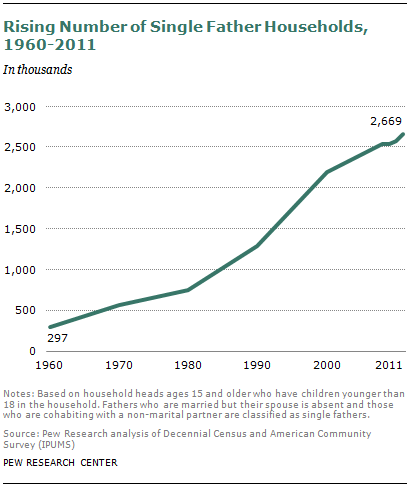 Fathers now spend more time engaged in housework and child care than they did half a century ago. And the amount of time they devote to paid work has decreased slightly over that period. Researchers investigating differences in fathering found that adopting parents were rated the most nurturing and involved compared to adopting stepfathers and nonadoptive stepfathers. Source: Schwartz, R.J., and Finley, G.E. (2006). Father involvement, nuturant fathering, and young adult psychosocial functioning differences among adoptive, adoptive stepfather, and nonadoptive stepfamilies. Journal of Family Issues, 27, 712-731. 20% of custodial mothers see no need for the children to continue a relationship with their fathers, and 40% of children of divorce haven’t seen their father in a year. The courts are quick to protect a mother’s right to financial support, but slow to protect a father’s right to child contact. At-Home Dads – According to 2012 estimates, 189,000 married fathers with children younger than 15 have remained out of the labor force for at least one year primarily so they can care for the family while their wife works outside the home. The number of children with a father in prison increased from 881,500 in 1991 to more than 1.5 million in 2007, a 77% increase. During that time, the number of children with a mother in prison increased by 131 percent, from 63,900 to 147,400. Source: Lauren Glaze and Laura Maruschak, Parents in Prison and Their Minor Children (Washington, D.C.: Bureau of Justice Statistics, 2008).